Raven Industries Earnings: Is the Worst Over? Raven Industries has had a rough year, missing its earnings expectations by an average of 12.2% over the last five quarters. This article examines Raven Industries' latest quarterly results to see if the worst is over for this dividend growth champion and if it is time for investors to climb on board the gravy train to profit and prosperity. This article originally appeared as part of ongoing coverage in our premium Motley Fool Rule Hidden Gems service...we hope you enjoy this complimentary peek! Over the past year Raven Industries (NASDAQ:RAVN) has struggled as major weakness in two of its three business segments drove down sales and earnings. Unfortunately, the latest quarterly results show this weakness continuing and the stock is down 9.3% as a result. Raven reported second-quarter sales of $94.5 million, up 1% from the same quarter of 2013 but 5% below what analysts expected. Earnings declined by 7.2% and missed expectations by 19%. Sales were flat over the last six months, but earnings have declined by 15.7%. The news wasn't all bad, with sales of proprietary products rising 10%. In addition, Engineered Films posting a 14% revenue gain and 22% increased operating income due to stronger pricing and improved margins. Once more the problem was the Aerostar and Applied Technology segments, which continue to show weakness as management attempts to shift the company away from slow-growth contract manufacturing and toward proprietary technology, which is the company's traditional strength. According to Raven President and CEO Daniel Rykhus, "As we exit the low-growth contract manufacturing business, in the short term, Aerostar and Applied Technology revenues are affected. In the second quarter, this planned runoff resulted in revenue decreases of approximately $5.5 million for Aerostar and $1.6 million for Applied Technology. " During the quarter Raven Industries acquired Dutch GPS steering systems provider, SBG, for $5 million in cash and $2.5 million in potential earn outs over the coming decade. Unfortunately, SBG's 2013 sales were only $6 million and management doesn't foresee those revenues being able to offset what Mr. Rykhus calls "eroding grower sentiment" and "subdued demand for precision agricultural equipment." The latest quarter's weakness mirrored the first quarter, when Raven Industries missed earnings expectations by 6% as earnings declined 21% on the back of a 1% revenue decline compared to year over year results. That quarter's weakness was caused by a 19% decline in the Aerostar segment due to delivery timing issues and planned decreases in defense spending. Applied Technology, which builds GPS and computer guided control systems for farm equipment, also struggled due to continued weakness in the agricultural prices, as seen in the below chart. 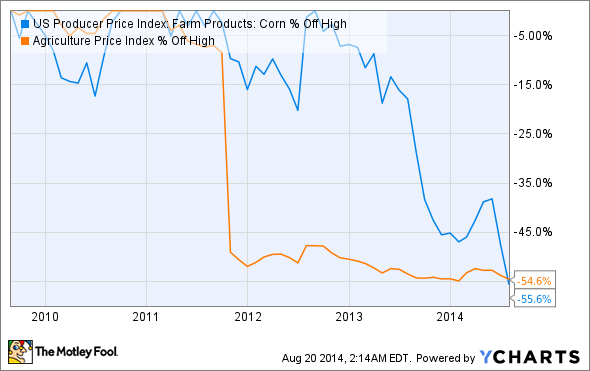 US Producer Price Index: Farm Products: Corn data by YCharts. Management's guidance for the third quarter included continued strong sales from Engineered Films and continued weakness from Aerostar due to deferred Aerostat (surveillance balloons) and radar deliveries. Management warned of a double-digit percentage decline in company wide net income for the third quarter, with modest earnings growth returning in the final quarter of the year -- though not enough to post full-year earnings growth. Investors and potential investors should keep an eye on three things. The first is how Raven's struggling Aerostar and Applied Technology divisions perform over the next few quarters. Increased deliveries to Google's Project Loon should help ameliorate weakness in the third quarter and help the company's Vista Research subdivision sustain its recent strength. Raytheon has chosen Vista Research as its preferred radar solutions provider for future projects, and a good deal of Raven's future success is riding on this relationship bearing fruit. Raven Industries recent received an $8.4 million contract from the U.S. Army for maintenance and operation of Persistent Ground Surveillance Systems that is expected to be completed by the end of the year. More contract wins like that would greatly help Raven with the second of my three key factors: dividend growth. Raven Industries hasn't raised its dividend for five quarters, and the company is in danger of losing its dividend champion status (which requires consecutive annual dividend increases on a trailing 12-month basis). Losing this status would remove Raven Industries from consideration by many dividend-growth investors. Finally, investors should monitor how well management can execute on growing Engineered Films, which is its second-largest and fastest-growing segment. This segment has the benefit of being driven by three major megatrends: America's continued shale oil and gas boom, long-term growth in global food demand due to population growth, and increasing spending on environmental clean up efforts. The growth of Engineered Films is key to Raven Industries achieving analysts' projected 10-year annual earnings growth of 15% and dividend growth of 13.4%.